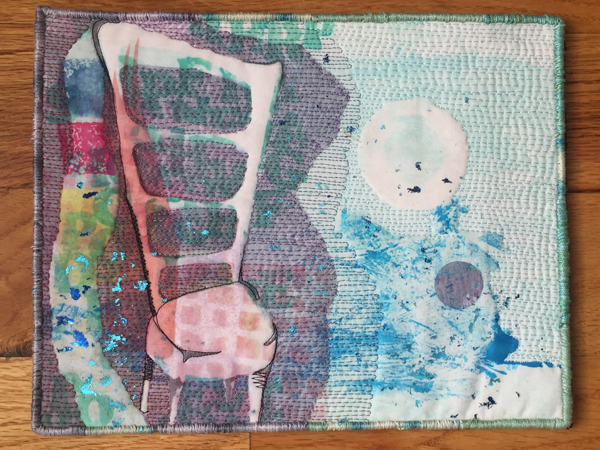 Art Quilt Collage: A Creative Journey in Fabric, Paint and Stitch, Book Release Blog Hop with Video Chats! First, I just want to say, I love Deborah Boschert, her art and her person. I feel blessed to know her and great gratitude that her talent calls her to write about her process. 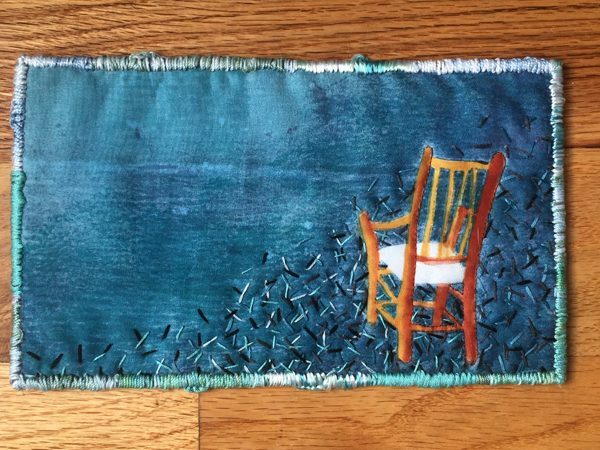 Deborah is just releasing, Art Quilt Challenge, A Creative Journey in Fabric, Paint and Stitch. 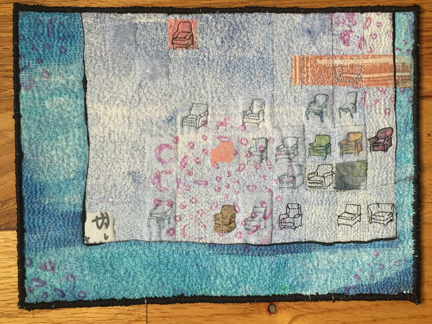 Deborah asked me to read Art Quilt Challenge and to have a discussion with her about symbols, which really turned into an eye opening endeavor for me. Deborah and I both use symbols and symbolism in our work. Deborah clearly lays out how to find and access symbols that resonate with you, helps you attach meaning to those symbols and then illustrates different methods to using those symbols in your work. Within the pages of Deborah’s book she uses chairs, a bowl, a ladder. These all have very different meanings to Deborah, than they do for me, or you-probably. Symbols are a means of visually communicating idea. As we learn to express ourselves artistically, it is a good idea to apply meaning to the symbols we use, even if we never tell anyone what our intended meaning is! And, of course, the viewer of the artwork brings their own history, interpretations and personal connections to what they are seeing. Chairs, in my own artwork, speak to the human form. Chairs are made for humans. Walking into a room with chairs lets you know, you can relax. There is symbiosis between people and chairs. And so, when it comes to my art, when I use a chair in artwork, I am working with ideas related to people, bodies, and -who- might use that perch. Deborah thinks about the -activity- that can be done in a chair when she describes ‘quietly embracing the opportunity to be restful, but not idle or inactive’. This was an ‘aha moment’ for me, that illustrates, symbols really do have a wide array of meaning, artistically speaking. And each of us applies meaning in ways that are meaningful to us individually. So, if you are feeling like you would like to explore your own use of symbols, and would like to unpack and use some innovative and fresh techniques, I do hope you will purchase a copy of Deborah book. Deborah’s book covers design, composition, collage, surface design, stitch by hand and machine, as well as finishing techniques, walking you through the entire process, while helping you understand it with deeper meaning. Beside which, Art Quilt Collage is eye candy! I use sign writers quills often in my work as well as ocean and beach motifs. Growing up on an island and spending much time on the beach or in the water has definitely had an impact on my art. And years as a sign writer has translated very nicely into using my skills in fabric. Thanks for the chance to win this book-looks wonderful! I love chairs too! also circles, semi circles and guinea fowl! I don’t have any symbols that I use, but I do like using stripes. As of yet I don’t have a personal symbol. Maybe that could be because I have not developed a big enough body of work or that my work is more realistic than abstract. Definitly some thing to explore! The symbols I often use are elephants and zigzags. One of my favorite symbols is a circle that has a cross that breaks it into four equal parts. That one has lots of meaning for me. Another is a tree – growth, life, reaching out to man and above. And finally a hand with an extra finger. When I carved the stamp, I was intending to just make a hand. The extra finger was a muse inspired “oops.” I see it as a hand with extra abilities – like most “makers” have. I have never thought of a personal symbol before in the terms as you said. I have always liked butterflies. I have incorporated them into my quilts. So I guess I need to think about the why, so I can have more meaning in what I am doing. I haven’t really gotten into symbol use…it’s something I hope to explore, though, now that it’s come up repeatedly in this blog hop. Thanks for the giveaway! I really enjoyed this interview. The two of you went into great depth about how symbolism resonates with the maker and the viewer and how it is fluid in meaning and interpretation over time. I’ve used leaves (to me representing regrowth/regeneration) and musical notes (representing creativity and giving/generosity) in my free-motion work, but haven’t yet explored art quilting and symbolism, which is my goal. Would love to get this book!!! I use birds as my symbols and circles for continuity. I like to use circles for their visual form. My brain does not really think in symbols. But my motto is “live life by the experimental method”, so if I were able to represent that thought as a symbol, I probably would. Thanks for this fabulous blog hop. I seem to focus on symbols from nature–trees, leaves, birds,nests, etc. Personal connection is the love that my grandmother showed for her garden and the dear creatures that inhabited it. Loved your video with Deborah and would absolutely enjoy winning a copy. I have not thought directly about using symbols in my work. I do use waves, vines and leaves a lot. I want to read this book. I often use circles with lines emanating from the. as a symbol of the cycle of my chronic illness. I can be in any part of that cycle and I try to pull out of that cycle, even if I’m at a low point health wise. It looks like a cool book! Thank you for sharing. I use a lot of hearts in my work. Also love lots of curlicues in my quilting. Thanks for sharing the giveaway. Very interesting! I use spirals quite a bit, depicting wind or water. Nature and human symbiotic interplay. The other symbol, and I am using that term broadly as it may not truly apply, is the long hair on the women in my work. To me it tells of the strength women hold, the intertwining with our natural world. A maternal power and grace to have a firm but gentle grip. Which is not to say short or shorn hair is any different! Therefore I use it symbolically. I haven’t completely figured out my own symbols, which is just one reason I would love to win Deborah’s book. But I do use a lot of geometric shapes in my work, especially circles. Like many, I also use circles. But also birds and flowers. Just never really have identified any significant meaning to them. Arrows. I don’t know why it started, but the first time was in the Folk Art design work I did for London City and Guilds. I continue to turn to arrows frequently. While I haven’t used it too often in my work yet, I’m still finding my way there, the moon had long been my personal symbol….always the same, endlessly changing, thanks for this opportunity and for your interesting post about your symbols. I haven’t used symbols in my artwork, but am intrigued by the idea after watching the video. Thank you for the opportunity to win a copy! I use feathers whenever I can. To me they represent flight, freedom, soaring. I also love bird images and ginkgo leaves. II like to use silhouettes of human forms as symbols in my art quilts and would love to win a copy of Deborrah Boschert’s book. Thanks! This post speaks to me because I am currently searching for which symbols mean the most to me. I see so much symbolism in other’s work that I wonder… That Deborah addresses this very issue is interesting. I am curious about her process. It is so much fun to see people I “know” work together and how different each interprets the same idea. I guess I really don’t have one symbol. Ages ago I read Angeles Arrien’s book on the Symbols of Life -circle, triangle, square, spiral, and cross. I’ve always been attracted to spirals, maybe my Celtic ancestors? So, there is usually a spiral hidden in my work or a bit of nature – leaves, insects, flowers, etc. I love the idea of chairs. I love and collect chairs, especially really old hand made ones. I think of the maker and look for their tool marks. Deborah’s book sounds exciting and will be on the next shopping list! Thanks for sharing your artwork and your conversation! Now I want to go pet chairs.LOL! I used to have horses as my symbol although I didn’t call it that. I have always loved them and lions since I was a little girl. Now my symbol is a cat and a Sunmoon. Cats and horses are similar to me and did you know they can be great friends to each other? My friends horse had a friend cat who slept on his hind quarters. Symbols of dragonflies and honu, (Hawaiin sea turtles), are part of my artwork, both have survived through the ages and represent both freedom and endurance to me. I am interested in reading about different methods of using symbols in my artwork. I’ve always used the Ohio Star as a symbol. The continuous line to form it signifies the journey of life. I’m inspired by the different interpretations even a common, simple symbol evokes to the various eyes of the beholders. It is so interesting making art that talks to me, then if I’m lucky, learning what the conversation is between the art and the viewer. Thank you for sharing Melanie and Deborrah, the book looks like a great one to add to our libraries. I favor circles and spirals. I feel they connect me to the continuation of life and the universe. I particularly like trees, leaves, spells, birds, nests, and feathers. Spirals, circles. Teapots. I’d love this book especially as a birthday gift! It’s oct 6th. I haven’t created that many art quilts over the years, but I have incorporated keys, flowers, and circles into the pieces that I have made. Thanks for participating in Deborah’s video Blog Hop! I’m hoping to win a copy of the book for my guild library, as I already have a copy of my own. I love symbols in art. Right now my most used symbol is the peace sign. I feel that if you put peace out into the world it will be passed on. At least I hope it will. I like using circles. I also like using anything related to birds – a feather, egg, nest, or a bird itself. I like circles and moons, but don’t really use them that much. I would like to incorporate ferns into my work (and mountains a little, too) to reflect my beautiful Pacific NorthWest background. I once tried collecting fern fabrics, but now would like to try quilting the shape. I don’t have a specific symbol, but I get very much inspired to explore and find my own. chairs happen to be an image i come back to ever so often as a symbol of welcoming…. in my house all my chairs have a story……another symbol I turn to ever so often is the hand…it is so versatile, meaning so much but as in art I like variety too so hands don’t always appear in my art…Birds and the nest they leave empty is now very actual in my life. Of my symbold I created stencil and stamps so I can make the reappear more often in my journaling for instance. right now i’m building up fabrics having been dyeed naturally…the dyeing process being an important passage….next is my great sewing project with this. My symbol is a tree, as a connection to nature as well as a symbol of strength, perseverance and endurance. I look forward to reading about how to incorporate these into my quilts. A great conversation – thank you for sharing. It made me walk around and look at my environment differently curious what might find its way into my personal symbols.